Headlines has tons of requested features like featured area, social bookmarks, author highlighting, flexible layout to name a few. It’s the perfect platform to launch your magazine or blog and reach out to the world. 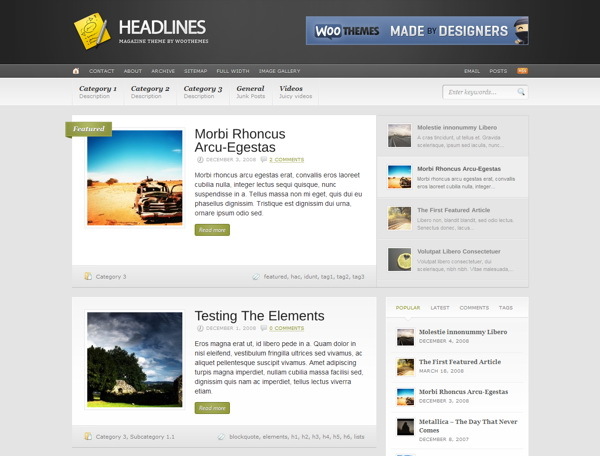 The theme has a Featured jQuery tabber/slider area above normal posts to showcase your favorite posts. Can be static or set to slide automatically with built in options. Show your latest tweet in the header (instead of 468×60 ad space). There is a custom social bookmark option at the bottom of single posts to share your writings with ease, a nice Author box widget on single posts, a Cufon font replacement makes all titles look smooth (can be disabled). You also get 4 different ad spaces (header, post content, sidebar and footer) and 4 different ad sizes (468×60 top, 200×200 content, 300×250 and 125×125 widgets). Show your adsense code or a image ad. Very flexible layout, so you can easily change sidebar position, image position in post etc. and custom Widgets for use in sidebar and footer: Flickr, Video Player, Author, Search, 300×250 ad, 125×125 ad (max 6) as well as 15 stylish alternate color schemes to choose from + custom color picker for top background color and link/button color. Making simple changes without editing code, like adding your own logo, changing to an alternate color style, adding Google Analytics code, couldn’t be easier with the back-end theme options panel. The theme is compatible with all the modern web browsers like Firefox, Safari, Chrome and Internet Explorer. There is an image resizer script built into the theme framework to automatically scales your post images for pixel perfect display in our templates. No need to upload new cropped images when re-designing your website. It comes packaged with a .po file for easy WordPress theme translations into your desired language – editing one neat little file without hunting down text in the theme templates.